The title immediately of the poem immediately set off an Elliot Smith song in my head: Everything Means Nothing To Me. A fructiferous juxtaposition considering that Smith sings of hopelessness (made even more plangent by the knowledge that he allegedly took his own life in 2003, by stabbing himself through the heart with a kitchen knife) whereas Whyte sings resolutely of hope. Hopelessness, the song seems to suggest, often lies in the lack that reveals itself when casting one’s mind backwards and forwards through our own prefigured life-span as part of a comparative exercise. The deficiency reflected back at us, Narcissus-like. If the self-reflection is shouting a reminder of “everything we’re supposed to be” based on past daydreams and future aspirations, the blue songbird on your shoulder will keep singing on your shoulder its dirge of depression: everythingmeansnothingtome, everythingmeansnothingtome, everythingmeansnothingtome. Whyte keeps us focused in the present. There is no looking back, and although he suggests some sort of future “pay-off”, even a preliminary reading of the poem indicates that the everything waiting for us, and more to the point, everything we’re waiting for, can be found right here and now: in the “tiny, hidden” data of our world. 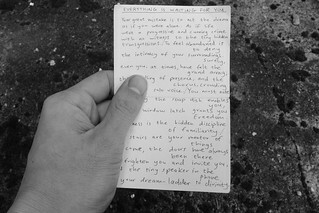 So I begin carrying around the poem copied neatly onto a 5″ x 3″ Correspondence Card, the card starting to feel intimately used as well as useful, on its way to disintegration through repeated folding. I mainly work on memorizing whilst walking. I’ve even try taking one step per word, envisaging the sentences cleaving to the rhythms of my body, the walk becoming the poem becoming the walk. I’m not sure if the poem might be drummed or marched into me like this, but I’m giving it a go. Embodying the words is key. I need to get to the point where I can recite it as naturally and “automatically” as I might the days of the week, or the months of the year. The rhythms need to sink in, sync with breathing, so that the poem becomes a way of focusing and potentially stilling the mind through language for a minute or two, rather than just an anxiety-producing sequence of memory-potholes. On a train from Mill Hill Broadway, travelling north in search of a walk, I sit opposite a young family. The father has his child resting against the beat of his heart. I watch the tympanic petting of his fingers on the infant’s back. They are clearly both soothed by this interaction. This is where the conversation with the poem begins, I think. Twenty-two years ago, during one of those impossibly short but paradoxically long 12-week terms at Cambridge, when one is expected to cram a couple of centuries worth of literature into your head and keep it there, it was suggested I might read Frances Yates’ The Art of Memory. I started it, the book bored me silly, so I read something else. Even had I read it cover-to-cover, I wouldn’t remember a single line, as I don’t remember anything I read at University, either critical or primary texts. Were I to do it all again, I would join an institution whose sole curriculum consists of having to learn a poem a week (from “the Canon”, if you must), and anything else you might want to dip into around that, with a tutorial based on the recitation of your poem, a cup of tea, and a chat. Your final “exam” would have you reciting as many of the poems you can remember, followed by an audit of your heart and mind in the fullest and least fact-checking sense possible. Such a University and such a course doesn’t exist, but it should. Frances and I are back together again. And this time, I’m ready for her, relishing the arcane lore she’s intent on telling me about (no more arcane, as we are both aspiring mnemonists). Or not. For although she whitters on about it, Frances has never utilized the mnemotechnics she writes about. No walking the talk for Yates (she is an academic, what did you expect?) but still a great primer on art of memory, or memorization if you prefer. We moderns who have no memories at all may, like the professor, employ from time to time some private mnemotechnic not of vital importance to us in our lives and professions. But in the ancient world, devoid of printing, without paper for note-taking or on which to type lectures, the trained memory was of vital importance. And the ancient memories were trained by an art which reflected the art and architecture of the ancient world, which could depend on the faculties of intense visual memorisation which we have lost. How skittish and pliable the mind, but perhaps another piece of evidence that everything is waiting for you, particularly the books, people, and experiences you now dread having to spend time with, but might love when you’re ready for them to come into your life.